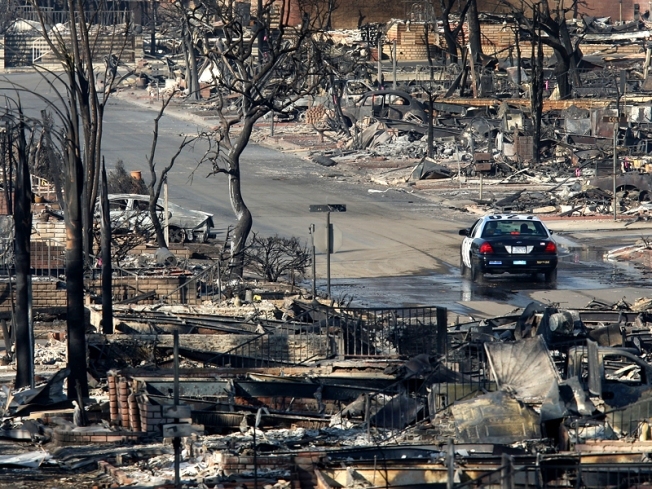 Police patrol for intruders in the ruins of the Oakridge Mobile Home Park, where 480 homes were destroyed by wildfire as residents are escorted in by bus to see their devastated neighborhood, Nov. 17, 2008 in Sylmar, Calif.
SYLMAR, Calif. -- A mobile home park that was partially destroyed by the 2008 Sayre Fire, which blackened 11,262 acres in the Sylmar area, will be cleaned up thanks to $1.5 million in federal and state aid, city officials announced Thursday. The Federal Emergency Management Agency and California Emergency Management Agency will provide $1.5 million to remove debris from the Oakridge Mobile Home Park. Last November, the fire destroyed 487 mobile homes. "When the smoke cleared and the last flame was extinguished, the city of Los Angeles pledged to help the residents of Oakridge rebuild from the devastation left behind," said Mayor Antonio Villaraigosa. "Removing the fire debris will not only begin the process of rebuilding, but will eliminate the constant threat lingering in the ashes and loose debris threatening to once again endanger the well being of the surrounding community." 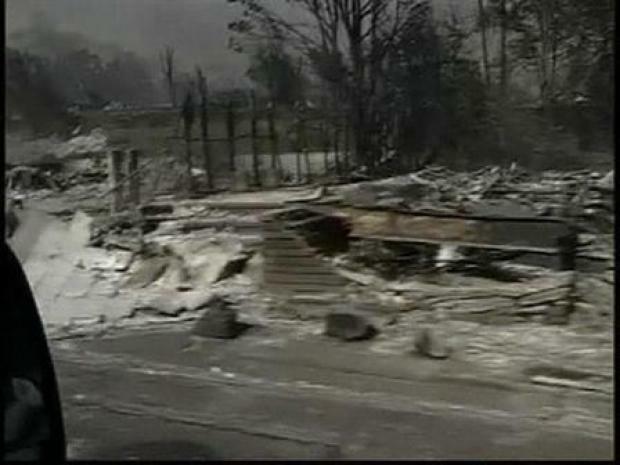 Some homes are spared, other are burned to their foundations at the Oakridge Mobile Home Park in Sylmar. The city of Los Angeles will contribute $102,106 to the debris removal, which is expected to be completed by the end of April. The clean up effort will also allow residents from 100 trailers that were uninhabitable because of hazardous materials in the park to return home. "We have said from the beginning that the rebuilding process at Oakridge will not be a fast one, but with the cooperation and coordination of all levels of government -- local, state and federal -- we are doing it as quickly, efficiently and safely as possible," said Councilman Richard Alarcon, who represents the area.